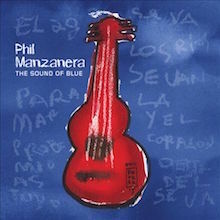 With the lovely new album The Sound of Blue taking up much of our listening time – especially the elegy to Cornwall’s “Rosemullion Head” and “No Church In The Wild”, featuring Sónia Bernardo, this is the ideal time to take stock of Phil Manzanera’s illustrious and varied career. That latter track has, by the by, taken Phil on a roller coaster journey since it’s use in The Great Gatsby and karmic discovery by Kanye West, Jay-Z and 88-Weeks who sampled Phil’s 1978 riff on their album Watch the Throne. Phil chuckled when he opened his royalty statement but, hey, couldn’t happen to a nicer guy. Phil, we mean! 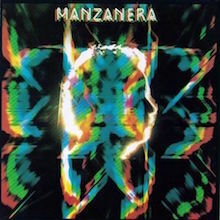 Of course Manzanera is a bit of a legend – anyone who has played guitar in Roxy Music has to be, but his own catalogue is made for discovery. The debut Diamond Head is the obvious launch pad for newbies, with a cast list that includes Roxy men Andy Mackay, Brian Eno, John Wetton and Eddie Jobson. 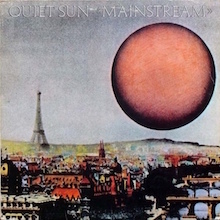 The success of his Mainstream disc (1975) featuring reworking’s of his earlier band Quiet Sun, also a glimpse of Eno’s oblique strategies, a device used to encourage artists to look at their work from different angles. Around this time Phil produced John Cale’s acclaimed Island album Fear and contributed memorable guitars to the feedback extravaganza on “Gun”. During a Roxy hiatus Phil also produced the debut album for Split Enz, the New Zealand art rock group who had supported Roxy Music under the Southern Cross. More recently he has renewed a fruitful working relationship with his friend David Gilmour whose 2015 disc Rattle That Lock finds both men to be on top form. 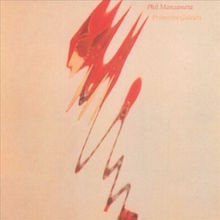 Phil’s discs can be heard in remastered form on his own Expression Records, Try Firebird V11, whose title references the Gibson guitar he played on Roxy Music’s albums. All the music he makes has integrity and merit. Born Philip Geoffrey Targett-Adams in London, 1951, Phil took his mother’s maiden name for his stage persona. He spent a lot of his early childhood travelling with the family in America, Central America and Cuba. He developed an intense interest in Latin American dance rhythms en route – merengue, cumbia, salsa – and as a teen learnt a repertoire of Cuban folk protest songs. His later schooling was in London’s Dulwich College where he befriended a variety of future accomplices like Bill MacCormick, Charles Hayward and Dave Jarrett. College bands Pooh & The Ostrich Feathers and thus Quiet Sun played in the progressive or avant-garde style pioneered by art rockers during the late 1960s in what became known as the Canterbury Scene. Phil didn’t pass his initial audition for Roxy Music but when the in situ guitarist David O’List departed he was called back and landed the gig. The rest of the Roxy story is for another place and time but needless to say Phil’s role in that singular act’s rise to fame is vital. His trademark wraparound fly sunglasses and his amused take on glam rock and roll clobber made him a favourite for those who studied him right of stage. Given that he never intended to be tied down by success Phil’s first solo album was a given. Diamond Head is a gem. Eno sings on “Miss Shapiro”, while the single, “Frontera”, carries Robert Wyatt’s distinctive tones. Keen to re-establish his roots Phil also features Quiet Sun on the instrumental “East of Echo”. 801 - Listen Now (1977) includes all original material again, written by Manzanera and the MacCormick brothers Bill and Ian (aka Ian MacDonald, the late, great music writer and author of Revolution In The Head). Guests include Kevin Godley of 10cc, Eno, pianist Billy Livsey, Rhett Davies and Francis Monkman, all cream of the crop British talent. Crowded House fans may not know that the Finn brothers (then Split Enz) sing on the K-Scope disc (1978). The track “Remote Control” is enhanced by their blissful harmony vocals. This is where you’ll find the cosmic twang of “K-Scope” (later to be the aforementioned “No Church in The Wild”), a sublime example of modern fusion with extra effects provided by Lol Creme (10cc). Ostensibly this is a rock album but it veers off on so many tangents it could be considered a crossover jazz disc. One of our favourites. The experimental Primitive Guitars and the more formal Wetten/ Manzanera collaboration close a chapter for Phil who will soon return to Latin themes on Orquesta Luna y Phil Manzanera and Southern Cross, a real melting pot affair that zips from Havana to Auckland. Thereafter the Expression Records discs are all recommended, as are those on Hannibal, especially 6PM, a set of songs graced by Chrissie Hynde, Roxy mates Andy Mackay, Paul Thompson and Eno, the classical pianist Nigel Simpson, Robert Wyatt on drums and trumpet and David Gilmour’s sinuous lead guitar on the closing tracks of Phil’s conceptual suite Cissbury Ring, an elegiac walk through the South and West counties of England. A lot of that cast shows up for 50 Minutes Later, a modern take on progressive rock with electronic chaos thrown into the mix by Eno on the bizarre “Ebotonik Bible Black”. For your further enlightenment and delectation, or if you want to dip in with an overview, then try Guitarissimo or the excellent compilation The Manzanera Collection: John Wetton, Nico, Roxy Music, Tania Libertad and the Brazilian guitarist Sergio Dias all shine alongside Manzanera who proves to be the most generous and democratic of musicians and a credit to his art. Liner notes are by Ian MacDonald. 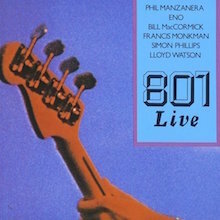 801 provided Roxy Music guitarist Phil Manzanera with one of his most intriguing side projects. Although the band only played three gigs in August and September 1976, this album captures a night when everything fell right into place musically. That should only be expected with names like Eno and Simon Phillips in the lineup. (Still, the lesser-known players -- bassist Bill MacCormick, keyboardist Francis Monkman, and slide guitarist Lloyd Watson -- are in exemplary form, too.) The repertoire is boldly diverse, opening with "Lagrima," a crunchy solo guitar piece from Manzanera. Then the band undertakes a spacey but smoldering version of "Tomorrow Never Knows"; it's definitely among the cleverest of Beatles covers. Then it's on to crisp jazz-rock ("East of Asteroid"), atmospheric psych-pop ("Rongwrong"), and Eno's tape manipulation showcase, "Sombre Reptiles." And that's only the first five songs. The rest of the gig is no less audacious, with no less than three Eno songs -- including a frenetic "Baby's on Fire," "Third Uncle," and "Miss Shapiro"'s dense, syllable-packed verbal gymnastics. There's another unlikely cover of the Kinks' "You Really Got Me," while Manzanera turns in another typically gutsy instrumental performance on "Diamond Head." This album marks probably one of the last times that Eno rocked out in such an unself-consciously fun fashion, but that's not the only reason to buy it: 801 Live is a cohesive document of an unlikely crew who had fun and took chances. Listeners will never know what else they might have done if their schedules had been less crowded, but this album's a good reminder. Phil Manzanera's first post-Roxy foray into solo albums is a terrific all-star affair that still holds up enormously well. Calling on favors from Roxy members present and past, and those from the Cambridge/British art rock scene, Manzanera assembled a supergroup for every song. Robert Wyatt sings Spanish gibberish on the opener "Frontera," a rewrite of his own "Team Spirit." Brian Eno teams up for the sunny "Big Day" and the nonsensical "Miss Shapiro," both of which would not have been out of place on his own early solo albums. John Wetton (of several groups including Family and Asia) sings a duet with Doreen Chanter (of the Chanter Sisters and the Joe Cocker Band), and Bill MacCormick of Matching Mole and Quiet Sun sings his own "Alma," the album's closing ballad. Fans of any of the singers above, not to mention Manzanera, whose party this is, won't be disappointed. A majority of these tracks went on to form the set list for 801 Live. 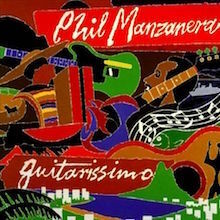 Phil Manzanera's Guitarissimo is a deft conglomeration of some of the highlights of his previous albums (Diamond Head, Primative Guitars, Listen Now, 801 Live, etc.) that aptly provides any uninitiated listener with one of the better "Best of" experiences to be had. It is the perfect starter piece for anyone looking to see what mettle one of the founding members of Roxy Music was made of. And let's not forget some of the guest stars complimenting Manzanera's guitars here: Eno, Mel Collins, Simon Phillips, Robert Wyatt, Godley & Creme, Tim Finn, and so on. Upon hearing it, the quest for other Manzanera offerings will surely follow. Phil Manzanera's pre-Roxy Music group never got to release their first attempt at an album, but in a break from Roxy in 1974, Manzanera regrouped the band and put out this effort, recorded at the same time as his solo extravaganza Diamond Head. Here, Manzanera disappears into the art rock group dynamic; the album is a selection of progressive jams featuring some tasty guitar work, complex rhythmic structures, and the always reliable bass work of Bill MacCormick. There is a certain dryness to the whole proceeding, a holding back, a lack of warmth, but perhaps this perception is derived from over half the tracks sounding so much better a year later as part of 801's Live, including "Sol Caliente," "Mummy Was an Asteroid, Daddy Was a Small, Non-Stick Kitchen Utensil," and especially "Rongwrong." Here the Charles Hayward song sounds like a university common-room joke, with its name-dropping of "reading Schoenberg in the bath" and such. Compared to the lush arrangement and rewritten lyrics of the Brian Eno-sung 801 version, Quiet Sun sounds like one album away from brilliance. Phil Manzanera had no problem filling his mid-'70s downtime away from Roxy Music. His guitar graced some 20 albums, like John Cale's Fear, Eno's Here Come the Warm Jets, and Nico's The End. This outing from his all-star side group is slicker than his 1976 live debut album, but no less worthwhile; some 16 musicians are credited. The sound is sleek and sophisticated; even lyrics aren't exempt from creative twists, as shown on "Listen Now"'s glistening jazz-pop -- which cleverly juxtaposes its title against a bouncy "now, now, listen" chorus. The song also questions how people are living life in a repressive society, even as "Law and Order" and "City of Lights" ponder its breakdown. Other songs visit more personal turf. "Flight 19" details a young man's angst-filled reaction to his lover's injuries, "Postcard Love" dismisses the perils of on-road romances, and "That Falling Feeling" takes a more wistful look at how people grow apart -- over a gliding Manzanera guitar part. (Yet another sly twist shifts the chorus from "Can't you feel it moving in?" to "You can feel it moving in.") Three totally different instrumentals round out matters. The best one is the lilting "Island," anchored by a climbing Bill McCormick bassline, as Manzanera unleashes his full array of guitar-altering devices. "Initial Speed" and "Que?" take more of a jazz/fusion tack; they're different snapshots of Manzanera's graceful, intelligent guitar style. This album's one of the most absorbing entries of Manzanera's lengthy career. 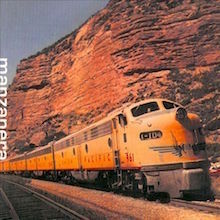 Marking Manzanera's tenth year of as a professional musician, Primitive Guitars means to be a looking back at his stylistic growth through a series of solo pieces that take in the various stages of his life: childhood in South America, adolescence in London, stints in Roxy Music, 801, and other projects. These are hinted at in the titles ("Caracas," "Bogota," "Ritmo de Los Angeles") and often in the Latin influences of the melodies and playing styles. On all these pulsing, groove-centered instrumental tracks, Manzanera is backed only by a drum machine and, on one tune, John Wetton on bass. Otherwise all the diverse sounds, noises, melodies, and rhythms have been created on guitar, linking Manzanera to another progressive virtuoso, Adrian Belew. In between tracks, Manzanera inserts snatches of dialogue recorded at various rehearsals, making this a successful, very personal album. David Gilmour has described Phil Manzanera as “El Magnifico Manzanera”, while Guitarist Magazine recently referred to him as a “national treasure”. Praise indeed, and it gives an idea of the esteem that this often underrated guitarist and composer is held in. I guess that most people who know the name Phil Manzanera would immediately think of Roxy Music,but in fact he’s had a parallel solo career for the last 40 years and has also collaborated with and produced many well-known artistes, such as Eno, Split Enz and Godley and Creme. Throw in the fact that he was musical director as well as a performer at the Guitar Legends Festival in Seville and will soon have the honour of being Maestro Concertatore For La Notte Della Taranta 2015 and you're looking at a pretty good CV! Well what has the solo career of PM produced over the years and how does "The Sound of Blue" compare? I think his best work comes when he’s working with other musicians, such as on “Diamond Head” and the musically brutal “Mainstream”, rather than on something like “Primitive Guitars”, but that’s not to say that that album is bad - I like it, but here is a person who can coax things from others, which is why he is such a talented producer. The “Roxyness” of his earlier albums faded when “Listen Now” was released, although this was revisited with The Explorers and Manzanera/Mackay and again there are some great moments to be savoured. When we get to “Vozero”, “6PM” and “50 Minutes Later” Manzanera is now singing on his own albums, but then he's always been something of an innovator, particularly with his guitar sound. “Firebird VII” is “Mainstream” revisited, although with less intensity, which brings us to “The Sound of Blue” (shouldn't forget PM's work with Spanish and Latin musicians along the way either, or his live albums, such as 801). IMHO this is an album from a man with nothing to prove, fresh from his work with Pink Floyd. In fact there is a great freshness to this album full stop, which is a tribute not only to the ongoing creativity of Phil Manzanera, but also to the supporting cast of musicians he uses, including Sonia Bernardo, Javier Weyler and Yaron Stavi. Bit of a mixture of styles too and plenty of the soaring, expressive lead guitar associated with PM, although this never dominates the recording at any point. For me the best tracks on the album are the instrumentals “Rosemullion Head” and “High Atlas”, which has a James Bond/spy movie feel to it. There is also a tribute to PM’s late mother, who introduced him to the guitar and latin music,and Andy Mackay makes an appearance too! Two of the tracks on the album ("1960 Caracas" and "The Sound of Blue") sound slighty familiar and I’m sure that they have appeared on “Primitive Guitars” in some form or another before, although this is not a criticism. Special mention must go to “No Place in the Wild”. If you don’t know the story have a look on youtube where Phil tells the story and gives a guitar lesson (more please Phil!!!). Overall I think this is a great album from Manzanera with several moments of unforced magic, a feature of many of his solo albums. It’s been well worth the wait! The films on Vevo which accompany each track are nice touches too! Buy it!